When it comes to developing your skills in the kitchen, it is worth spending some time getting the basics right. Much like learning to drive or learning another language, there are building blocks in cooking that help you to learn the more complex techniques in time. You can teach yourself, or be taught, a number of basic cooking techniques that will give you a great foundation for developing your kitchen skills. Depending on what type of cooking you are keen to do, you may find that some basic techniques are more suited to you than others. For example, stir frying is a popular cooking technique that enables you to create quick, healthy meals, which is perfect if you are looking to cook after work, whereas if you are keen to create big family meals, you may prefer to focus on roasting skills. Most basic cooking skills require an element of dexterity and confidence – both of which will come on in leaps and bounds the more you practice. You will soon find that many basic cooking skills are second nature, which will encourage you to develop your kitchen skills further. As long as you stay safe, don’t be worried about making a mistake (although it’s probably not advisable to go boiling a lovely piece of fillet steak) – just get in the kitchen and give it a go! 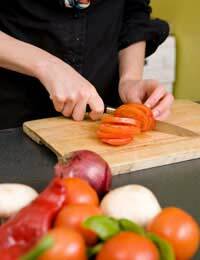 Chopping – The starting place for many recipes is the chopping of necessary ingredients. There are many ways of chopping food, depending on how long you are going to cook them and how you want the finished dish to look. In Chinese and Japanese cooking there is a great emphasis put on the correct chopping so that there is a beauty and uniformity in the dish. Western cooking is more focused on the practicalities of time constraints. Marinating – You can make even the cheapest cut of meat taste of something if you marinate it, although it is far better to choose an ethically produced product. Marinating is a way of adding flavour and tenderising meat and fish. You need some aromatic ingredients, such as herbs or spices, plus an acidic ingredient, such as lemon juice or vinegar and some fat – olive oil is great. Roasting – The simplest way to cook any meat, fish or vegetables is by roasting. You can make any ingredient taste wonderful by roasting them in a medium oven with some olive oil, salt and pepper. Add a little garlic and perhaps a little chilli and you have a perfect dish. A medium sized roast chicken takes around one and a half hours to roast. Frying – Chicken breasts, good quality cuts of meat and pretty much all fish is suited to frying. The current chef term of ‘pan frying’ means the same thing – what else are you going to fry in? – So don’t be worried that this is something new. You can keep frying as healthy as possible by using a good quality non-stick frying pan and just adding a little olive oil to the meat or fish before you put it in the pan, rather than pouring loads of oil into the pan itself.